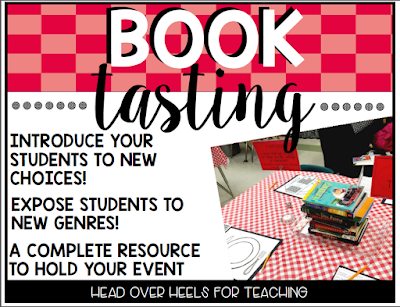 When I saw Joanne Miller's resource "Book Tasting: Introduce Your Students to New Books" resource I just knew I needed to have this resource. I'm always looking for ways to engage my first graders in reading, especially those more-reluctant readers. The resource is geared for second grade all the way up to eighth so I was a bit worried it wouldn't work for my younger readers, but it went great! The set up only took me 20 minutes. I shut the lights off, covered the tables with plastic table cloths, tea lights, plastic trays, table number signs and place settings. I bought the table cloths, tea lights and trays at the dollar store. Café music played in the background via the links Joanne had within the resource. They were great! I even plan on using them again during quiet times in the classroom. Since I have 5 tables in my classroom, I had 5 genres to introduce. Therefore, I wanted to start off by assigning students to 5 tables. After that, they were free to move about tables as they wished. Using the included reservation list, I wrote student names and the table names I was starting them off at. I used a classroom desk to hold the reservation list and extra menus. Each table was assigned a reading genre. I made posters for each reading genre. You can see them at each table. They are available for FREE in my store. You can grab them HERE. Also, at each table are trays of books (that match the genre), place settings for each student, a reflection napkin for each student, 2 tea lights, and a table number sign. Since I am currently using my clear plastic frames to hold my flexible seating poster, I couldn't use them for these reading genre poster. Instead, I glued the posters on 12x18 construction paper and stood it on end. It worked great! I was pleased to see that even the boys in the class enjoyed the fairy tale genre books. I was able to get 2 tablecloths out of 1 package by cutting the tablecloth to fit the table. I also tried to include books at various reading levels to accommodate all readers. Joanne of Head Over Heels for Teaching was kind enough to provide a scaled down version of the reflection and book review for me to use with my younger students that worked out really well. The visuals were very helpful for my younger readers. My high ability readers were able to use the book review that was included in the resource with ease. The book tasting lasted about an hour with my first graders and I will definitely do it again. They really enjoyed it. So...are you ready to put your apron on and give it a try?